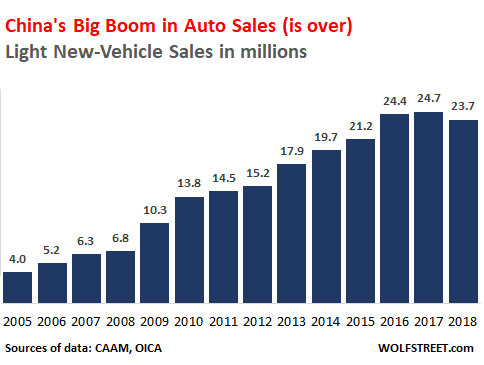 By comparison, over the same period from 2005 to 2017, US auto sales inched up 1%, from 16.95 million vehicles in 2005 to 17.13 million in 2017, with a huge trough in the middle. The Chinese market is now 40% larger than the US market. In the US, over the two-year period 2008-2009 combined, new-vehicle sales plunged 35%. In 2010, sales began to recover, but it still left sales down 28% for the three-year period. In China, new-vehicles sales rose 7% in 2008, and then more than doubled over the two-year period 2009-2010, bringing the three-year sales increase to 118%. Global automakers were betting heavily on China by building large-scale auto manufacturing capacity with their required Chinese partners. Now these joint-venture investments are translating into the dreaded word: overcapacity. GM and Volkswagen sell more vehicles in China than in any other country, including the US, and most of the vehicles they sell in China are made in China. GM’s sales dropped 10% to 3.65 million vehicles, including a 25% plunge in Q4. But its premium brand Cadillac saw sales jump by 17%. Ford’s sales plunged 37% to 752,000 vehicles, including a December collapse of 59%. Volkswagen Group was the largest automaker in China in 2018. Its luxury brands did well. Audi sales rose 11% and Porsche sales rose 12%. But VW sales fell 2.1% to 3.1 million vehicles. All brands combined, the group eked out a 0.5% gain for the year, to 4.21 million vehicles. The largest Chinese automaker, Zhejiang Geely Holding Group, had a strong first nine months, but then sales also dropped: October -10%; November -10%; and December -45%. As a sign of the times in China, the premium brands gained: Cadillac gained 17%, Mercedes-Benz 11%, Audi 11%, and BMW 7.7%. Sales of battery electric vehicles and plug-in hybrids surged 62% to 1.255 million vehicles, reaching a record 5.3% of total vehicle sales. China has been piling incentives on electrified vehicles, trying to push this segment to reach 20% of total sales by 2025. In addition, all automakers are now required to produce and sell EVs in China. The plunge in overall auto sales over the past six months says a thing or two about the state of China’s consumers. There is nothing in the data indicating that this was just a blip, as we might have inferred in July or August, or that the surge of demand is coming back. Auto sales are a reflection of the consumer. 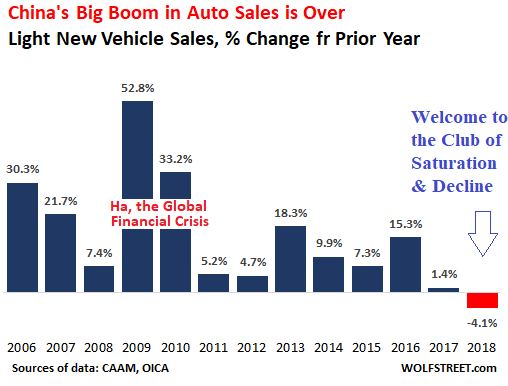 And the double-digit plunge in auto sales over the past four months is not a propitious indication about China’s consumers going forward or China’s economic growth that increasingly depends on these consumers. ← Bankruptcy Next, PG&E Says. Shares Down 90% in 15 Months. From “Investment Grade” to “Default” in Three Weeks? Has it ever dawned on them that new vehicles are now priced out of range for an awful lot of people. Me included. Over the years I have bought 8 new vehicles. The last one in 2008. The 2008 was $28,000.00. The same pickup now is $56,000.00. I am also now retired. I can see my wife now. Honey I am going to buy a new pickup. All it will cost is 100 percent of my Social Security for the next four years. By the way, do you like beans and cornbread? Has it dawned that if you’re going to blow $50K+ you might as well blow it on something you really want to drive? That explains the surge in premium brands, folks, not some tsunami of Chinese 1%-ers. Thanks for this comment. You put a smile on an ugly face. LOL Bill has it right on. After I retired from tech company I helped my daughter start a construction business late last year and purchased some new equipment for her in TX. A brand new 2019 crew cab 4×4 WT (work truck has no fancy pants stuff in it or on it) was 41k. If it wasn’t for the 179 tax rules allowing 100% of that as a write off giving me a 24% return I couldn’t buy it. Also the Chinese manipulated their sales. They had stuffed new cars in warehouses and on parking lots so they can fake production growth. I guess they ran out of room to stuff them LOLROFL. I saw another post about T going to China. Apple had Samsung make their phone components for a while and Samsung has kept up with technology and innovation. I wonder why? LOL Bet Tesla becomes obsolete 5 years after he opens a plant there from knock off Ts LOL. This is the very definition of insanity. All these companies think that going to China is the answer when we know from continued experience that their intellectual property will be learned and taken. The answer to this is simple. Only the common citizen of the US can fix this. We need to get off our a$$ and start working like the 40’s generation did with their own nationalistic attitude in business just as every other nation on earth is doing right now. We need to open businesses here in the US and not hire cryptic and sly foreign nationals to manage our records tech and production not have them manage our IT security LOL. Then we can regain technological dominance and move forward again. I am an inventor as well. Some of the things i invented are written on paper so they cant get stolen. My concepts are so advanced patent examiners from the company I retired from were so stumped they could fathom how to apply for the patent LOL. Trust me every piece of tech has back doors. Its been like that since late 90s and the 911 issues accelerated that. Hackers are not brilliant folks just clever in finding the door knobs lol. When i finally grow a tech business it will not be undermined by the fascinating errors our modern business leaders have created. My attitude also comes from being prior military. Your reply shows you are out of times with realty. US has always been an immigrant nation. Most of the companies in the US were and are started by immigrants. A majority of tech companies in Silicon Valley are started by foreigners. Foreign Talent creates millions of jobs in the US. US can only keep up with technology and innovation if it welcomes highly educated talented workforce from abroad. He isn’t talking against immigrants, he is saying physical outsourcing to other countries is, or is becoming, a major weakness. Sure there are profits from doing that also, but he is right. America is also independent natured you might remember. Sorry, but you need a fact checker. There are a large number of Foreign-born people in the US for sure, both ILLEGAL and legal. However, the US is NOT a nation of immigrants. Over 2/3rds of the population are native-born. AND, the vast majority of tech companies in the US, or Silicon Valley are NOT started by Foreign-born people. Big G’s post was largely about STOLEN IP. Surely you won’t contend that’s not an issue? Mechanical manual typewriters make a _great_ deal of sense in this day and age. And burn the ribbons after you’re done with them. You are right on the backdoors, have known this for a long time, from intel sources also and mil programmes. Most people figure they aren’t worth the attention I guess. Was a very odd position for me to watch this going on and not be in a position to say, or be believed. With China have to read up on how relations were forged, Taiwan, admittance to UN, to start to understand what kind of strategy is being played at a higher/deeper level. Like you say, the west sold out, which is ok maybe if there was a common destination, which there isn’t really or at least not one that is made public knowledge or has acceptance. I suppose some kind of convergence is hoped for, has happened to a degree, but I don’t see it as balancing out well. Fortunately the big T will be manufacturing in China shortly. Hell, they will even give Elon the Chinese green card, so he can sleep on the floor of the megafactory in Shanghai to inspire the factory workers there. If they don’t perform, he just has to learn Chinese to curse them out and fire them. So, the auto troubles will soon be forgotten as the glory of Elon descends in China. It’s like entering a mosh pit where any real ideas he has will soon be shared with every chinese electric car maker… oh except, they might already be ahead. Elon Musk has publicly state that all his technologly is open to anyone that wants it free. He claims that if anybody can produce electric cars better and cheaper than him and flood the market with them and put him out of business he would consider himself a success. His goal to to make electric cars available as a viable option of transportation. So, I don’t think China stealing his “secrets” which he has already offered to any one who wants them (open sourced) is going to do anything. He is going there because that’s where buyers are, and labor, plus no need to ship across the world. I wonder why ANY investor wants to give Elon money to furfill his dream of E cars at the cost of investor’s money. This is NOT sound investment to generate cash flows. This is hype up the concept and off load shares to who ever believe in the crap of advancing man kind at the cost of my own money. Unlike with taxation people have the choice to, philanthropy lives…maybe they are just protesting resource wars though. I guess guilt is for suckers, and empathy a fake news product nowadays. Invest in trees, they’re good for pulp fiction if you know any squid. My first new car purchase was a 1980 2 door ford mustang 4cyl, sticker price was $5,495 dollars. My job at the time was a carpenters helper making 10 bucks an hour. Today a lot of people still make 10 bucks an hour and car prices are 5 times the price of my first car. I wonder why people aren’t buying new cars lmao. But… but… but…. China is TEH FUTURE! Media told me so. I bet you’re a closet heretic. Wonder if capitalism might finally destroy communism. That’s ominous news and must have an impact on revenues & margin projections of the entire auto industry. On a different note, very impressive how hard China is pushing EVs. Before long, any car maker with reasonable volume and therefore cost degression in the EV segment will be Chinese. Plus hopefully Tesla. As the commentators stated above, car prices have become ridiculous and, absent a meteoric rise in Western real wages, the only way to square it is massive cost reduction which nobody does that better than the Chinese. Naff quality in cars has been done over the last 12 years. There is nowhere to run now in my view. The realities of can kicking economics is coming into harsh focus. “very impressive how hard China is pushing EVs”. It might make sense for China as china is the major source of rare earth in the world used for the manufacture of batteries. When Apple sounded the warning first the market sold off and then washed it away the next day because after thinking over they decided to BLAME APPLE and it’s high pricing. Now the auto industry is coughing and some say high prices. I say the trade war is crippling China and these are still good times. Wait until April. China will not make a long term deal with Trump and the rest of the tariffs will be applied. Currency wars become trade wars, trade wars lead to shooting wars. Got gold? CNBC current headline: stocks set to rebound as china showdown fears wane. On the same day, they have an article about China needing more stimulus as slowdown deepens! But that’s CNBC for you. It’s certainly very strange to see/hear people who would no doubt describe themselves as out-and-out free-market capitalists be so keen on state intervention when it suits…indeed,be apparently addicted to and reliant on it. No courage of conviction whatsoever. Just naked self-interest and “Do as I say, not as I do”. Currently having my first experience with a 2019 vehicle (USA)…a Subaru Forester loaner while my 2011 gets a new engine. With so many functions on screens, sensors for auto-braking, forward radar/lidar(?) for adaptive cruise, push-button start, engine stop/start at red lights etc etc, I cannot even begin to imagine owning something like this longer than its warranty. Think used-car buyers will become aware and prices, along with lease residual values, will plummet. May have to fly out to AZ or NM for a rust-free used car 4-6 years old and drive back to east coast. BTW if you have 2011-2015 burning oil, many 2.5L and some 2.0L engines’ warranties have secretly (no notification to owners) been extended to 8yr/100,000 miles. Google Subaru Oil Consumption Test. Subaru claims its 3.6R engines (six cylinder) are not affected, but disgruntled Outback owners say otherwise on the Subaru forums. Subaru’s handling of this has left a great deal to be desired. On the other hand, those of us with good experience re Subaru’s handling of its engine oil consumption problem are maybe not as likely to “go public” about it. Anyway, in view of my age and the distance to the dealership where I had purchased the car, when my 2017 Forrester proved to use too much oil, a loaner was delivered on a flatbed truck and my car was picked up and trucked to the dealership and had its engine replaced, no charge. The new engine does not consume oil and the car is now trouble-free. RD am happy you had a ‘good experience’, but you were fortunate to benefit from of a lot of people’s years worth of hassle and aggravation which finally resulted in Subaru losing a lawsuit. Subaru spent many years trying to convince customers that burning a quart every 700-1000 miles was normal. When doing changes, the oil looked, felt and smelled terrible…I never had any hope it would last 2-300k like my other vehicles, which produced an unhappy ownership experience for someone who takes pride in maintaining things. And then they did not notify affected owners of the warranty extension. I found out about it indirectly through a Wolf Street comment and when I arrived at the dealership they said my (secret new extended) warranty would have expired in 10 days! And as Gershon mentioned above, they are still getting away with not fixing the 6-cylinder that Consumer Reports confirms is just as bad if not worse. I won’t buy another. In the 90s, I had a Dodge Grand Caravan that, a year after purchase, started eating oil at the rate of one quart every 1500 miles. Took it to the Dodge dealer who insisted on doing an oil consumption test which confirmed that yep, it was eating one quart of oil every 1500 miles. They refused to fix it under warranty, saying this was “within specs”. One quart every 1000 miles. My daughter has a new Nissan with all the bels and whistles. She left to go away for a few weeks and inadvertently parked it in a no parking zone just across the street from my house as I had the drive blocked. When my nice neighbor came over to point it out to me, I had to ask her if she wouldn’t mind moving it, as I had no idea how to get into it and start it (keyless entry). I drive an old Toyota with 200k miles on it. My neighbor (somewhat younger than me) thought it was a bit humorous. Having switched to a car with adaptive cruise control last year my 60 mile commute has transformed from me having a sore foot to using the pedals for less than five minutes in over an hour’s journey. It’s wonderful and relaxing too. Technology does have its advantages. Adaptive cruise is useful, as roads are so crowded that you can barely use conventional cruise control for more than a few minutes. Blind-spot monitoring and backup cameras are also good features. You can see where this is going, auto purchases are just the latest iteration of decline and falling purchasing power. 40 years ago a working guy could pick up a small used Cessna and actually afford to run it. In 1974 I used to rent a Cessna 150 (wet) for $10 per hour, (included fuel, maintenance, and insurance). Everyone I knew had a small fishing boat for weekends, plus the truck and camper to haul it. Now, the truck price is almost a years income before taxes and in my rural area I know of at least 20 travel trailers that people are living in, year round. In Campbell River, population 35,000, I could count up an easy 200 travel trailer homes without even trying. (It’s a wealthy town, too). I started working full time 45 years ago and it was a given that an hourly paid worker could afford a truck, beer at the pub (beer parlour in those days) all Friday night long, and smokes if you wanted to smoke. All of that is gone. I could buy a small bungalow for 2X my yearly wages when I was 19 years old. Nowadays, a pint and a burger pushes $25. House purchases by 19 year olds in 2019? hah. The only people I see buying new vehicles these days are older folks who already have their money, or people just dumb enough to think that vehicle ownership = the monthly payment. My daughter and son-in-law both have solid degrees and excellent jobs. They are paid salary and know exactly what they earn and will earn. Budgeting is a snap. Their bungalow is a renovated 70 years old house once built for mill workers, and they drive a 12 year old Civic and a 14 year old Toyota truck. The odds of them buying a new vehicle is nil. Even my son, who is very well paid, has said he will never buy a new vehicle. The way I see this going is think of the early 1900s and imagine a computer assisted version. Rural folks will stay around home more and urban people will use transit, walk, or use bikes. Air travel? What was that? The money that is out there is already all spoken for. It is called, ‘Debt’. Very well put (as usual), Paulo. As you imply, some of us older folks prepared years ago to be financially independent, are now well off and debt free, could buy the latest this-or-that, but don’t. Its a counter-cultural, ethics thing. He explained it right after, “wet” includes fuel/fluids. Ah – I read that, but didn’t make the connection. and I fear for their future opportunities in this Country. If Roosevelt ran for election today, he’d be called a radical nutjob by the mainstream media. Today’s “moderates” are the nihilistic Libertarians who hate socialized medicine, but go to Canada for surgery (like Rand Paul). fyi, fdr was called a radical nutjob by many but i get your point and mostly agree. He was referring to the greater Roosevelt, Teddy. The radical extremists/fundamentalists are the neoliberals whose failed monomaniacal ideology has held unquestioned sway for 40 years now. The idea that societies and economies should be run only for the benefit of one type of human being – the private corporate stockholder – is ridiculous. And dangerous, as we now see in the social instability caused by the massive concentration of wealth and the polarization of the haves/have nots demonstrated by the disppearance of the middle class – which was formed largely by the skilled manufacturing jobs of the type the neoliberals could not wait to remove to countries wherein slave labor (effectively) could/can be exploited in the name of their ‘stockholder returns’. What is amazing is that they sell all these vehicles to people that predominantly ride around on bicycles, next thing you know they will be switching from the iron rice bowl to restaurants! The “China Syndrome” is showing up in more than just auto sales numbers. And it’s not just China, but global trade that is in contraction. The folks looking at the trade data are wondering whether the drop is simply an inventory-cycle hiccup (Greenspan type “soft patch”), or something more. Meanwhile, the stock and bond folks are looking at the markets and earnings announcements, and wondering if all the bad news has been priced in, or will there be more? Wolf’s auto-sales and housing data suggest there’s more to come. to expect the chinese to keep buying cars at the previous rate is stupid. most of these purchases are first cars. the market is mow maturing and we are moving into the replacement phase. it’s no different than smart phone adoption. also, there is no reason to assume that the chinese will replace cars as frequently as americas. how many miles per year do they drive? Correct. People in emerging economies don’t change vehicles (or decor) like they are changing their underpants. So is this a credit problem? It is a debt problem. The amount of debt which any and all businesses, governments, and persons can take on has absolute limitations, beyond which debtors become beholden to creditors. The pervasiveness of debt globally is no accident. It is one of the primary means by which the long-promised establishment of a cruel libertarian dystopia will be achieved. Relative resources being what they are, there is no chance this issue could possibly be resolved in favor of a just, peaceful, prosperous, and sustainably future. All major economic, political, and cultural trends converge to a miserably unhappy end, even for the predator class, with no conceivable path to avoid it. All things must pass. One must pity the children, knowing they have no future. While it’s true that never in the course of history have so many owed so much to so few, it’s the few (creditors) that have the problem when the many (debtors) become unable to pay. The adage is that if you owe the bank a million and can’t pay, you’ve got a problem, but if you owe the bank a billion and can’t pay, the bank has a problem. It’s equally true if 1000 people owe the bank a million each and can’t pay. At the individual level, excess debt makes debtors beholden to creditors, but at the systemic level the opposite happens. The creditors know that, but the debtors don’t. Yet. As for the children, they have no debt, so they can have a bright future – if they keep it that way. But they will have taxes! Who got bailed out in 2008-2009? Financial industry creditors got bailed out at public expense by the trillions, and their feeding frenzy continues to this day. Homeowner debtors got thrown under the bus by the million, and millions have still not recovered, and never will. You comment here regularly. How could you have missed the statistics on global business and government debt? How could you have missed the statistics on accelerating upward wealth redistribution and consolidation? Do you really suppose the financial industry will suffer as a result? Yes, they will have to pay the taxes formerly paid by the rich – to subsidize the rich with corporate welfare. Even taxes on the poor are rising – and the poor pay more in taxes than wealthy corporations, who pay none. Perhaps ‘absurd’ is the wrong word. Thanks for agreeing with my point: It was the CREDITORS who had the crisis when the debt burden became too high. I agree with you that the way that issue was addressed will be one of history’s greatest injustices. But it wasn’t because “debtors become beholden to creditors” as you claimed. It was because creditors controlled the political process and rammed the injustice down despite massive public opposition. TARP was opposed over 9:1 by the public but somehow passed anyway. There are many many historical examples where the debt level exceeded the safe level for a nation and the debtors forced the consequences on the creditors, instead of vice versa. This just wasn’t one of them. Wolf, I think you forget that China has given some tax reductions coming this January. This is the reason for a bad November/December. It will be interesting to see Jan/Feb sales.